Thanksgiving is coming up so for this new food Friday I thought we would give a receipe that involves pumpkin. Traditionally pumpkin pie is the dessert of choice but I can't stand it. Mostly because the consistancy of the pumpkin but I do love pumpkin bars or pumpkin bread. 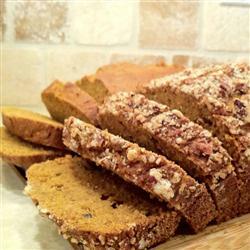 Thanks to Allrecipe here is some pumpkin bread to take to that Thanksgiving Dinner. Preheat oven to 350 degrees F. Grease and flour two 9×5 inch loaf pans. In a large bowl, mix together pumpkin puree, eggs, oil, butter, water, sugars and vanilla until well blended. In a separate bowl, whisk together the flour, baking soda, salt, cinnamon, nutmeg, cloves, ginger, pumpkin spice and walnuts. Stir the dry ingredients into the pumpkin mixture until just blended. Pour into the prepared pans. Bake in preheated oven 45-50 minutes or until toothpick inserted into the center comes out clean. While the pumpkin bread is cooling, combine all of the ingredients for the spiced glaze. Drizzle over bread and allow the icing to dry before serving (about an hour). Keep pumpkin bread tightly wrapped in plastic wrap to retain freshness.